Eyewitnesses reported chaotic scenes, as the incident unfolded just after midnight when worshipers had just finished evening Ramadan prayers. They said that the driver shouted, “I want to kill all Muslims” before onlookers pinned him to the ground. He was protected from a crowd by an Imran and other Muslims who have been credited with saving his life. 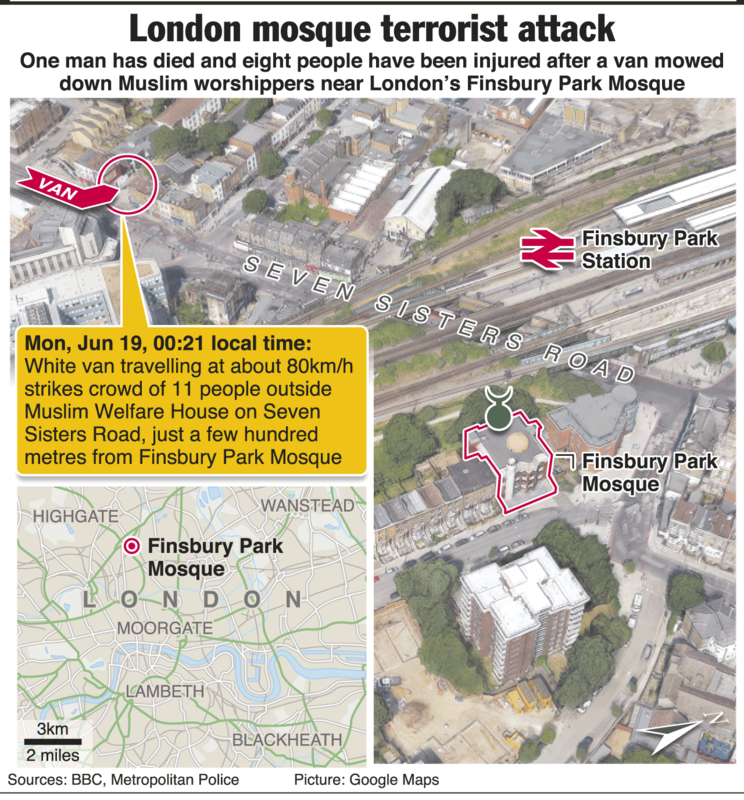 Much has been written and said by writers and analysts of print and electronic media about the terror attacks in Finsbury Park near a mosque. On the social media, the opinion of some Christians, Jews, and Muslims are divided, while elaborating the tragedy in accordance with their own particular religious background. Prejudice is running so high against one another that by reading the name, some people of the opposite side ignore his views. Despite it, fact remains that we are living in a world of Zionist-controlled media which is very strong and whatever it releases by concealing the truth and propagating Israeli interests as part of the disinformation, impress the politicians and general masses in the whole world. Therefore, terror attack on the Muslim worshippers in Finsbury Park cannot be seen in isolation. We need to analyze variously related developments of the recent past and the present ones in the world and inside the UK to reach the conclusion. Now, Trump has begun acting upon the discarded theory of the past in the modern era. It could be judged from the recent trip of Trump to the Middle East. Backing out from his earlier statements—banning the Muslims from entering the United States, whetting of the Muslims—blocking visas being issued to anyone from Syria, Iraq, Iran, Libya, Somalia, Sudan and Yemen—strict conditions for the citizens from Afghanistan, Pakistan and Saudi Arabia, the United Arab Emirates, Egypt and Lebanon, in Saudi Arabia, in his address at a regional summit in Riyadh, on May 22, 2017, President Donald Trump called for “Muslim unity in the fight against terrorism…a battle between good and evil…U.S. wants a coalition of nations who share the aim of stamping out extremists. This is a battle between barbaric criminals who seek to obliterate human life, and decent people of all religions who seek to protect it,” as he elaborated. In the meantime, last year, the success of first Muslim Pakistan’s origin Sadiq Khan as mayor of London by defeating the Conservative rival Zac Goldsmith-a wealthy Jew who was supported by the former British Prime Minister David Cameron also depressed the Israelis. In May 2015, the number of Muslim MPs in Britain increased from eight to 13. Although overtly President Trump has softened his external policy regarding Muslims and Islamic countries, yet covertly, he is acting upon the conspiracy of Mossad and RAW, which is, intentionally or intentionally, being followed by America’s Western partners against the Muslims. If not checked in time by the peace-loving Muslims, Christians, Hindus, Jews and Buddhists, these policies of the President Donald Trump who is particularly completing the extremist agenda of Israel are likely to result in more recruitment in the militant outfits, especially in the ISIS group, inspiring the extremist Muslims for more terrorism-related attacks. Israel, who will never accept the two-state solution of the Israeli-Palestinian issue, will prefer to seek the final revenge by bringing about a major war between the Muslim and the Christian worlds or to cause a major war between Russia and the US-led some Western countries, which will convert the entire world into the Holocaust.